We see several cases of "Bobcat Fever" every month during the tick season in our clinic. Most of these cases are manageable but some are so advanced that the pet passes during treatments. We at Rock-N-Country Veterinary Services want to make sure our cat owners are aware of this deadly disease so they can spot the signs early for fast treatment initiation. “Cytauxzoonosis.” CAPC Vet, 20 Feb. 1AD, www.capcvet.org/guidelines/cytauxzoonosis/. Cytauxzoonosis felis, also know as Bobcat Fever, is a tick-borne disease that affects all breeds of house cats in our area. This disease is caused by a parasite that lives inside the blood cell and is passed to the cat from infected ticks. The parasite can cause the blood cells to get so large that they block blood vessels causing organ failure. A second stage of the disease can also cause destruction of red blood cells leading to a fatal anemia. As a result, this disease causes anorexia, lethargy, fever and jaundice. There is no risk of human infection of Cytauxzoonosis felis! You cannot get it from your cat nor from ticks that have been on your cat. “Bravecto Topical Solution for Cats.” Merck Animal Health USA, www.merck-animal-health-usa.com/bravecto/topical-for-cats. Year round tick prevention is necessary to prevent this deadly disease! 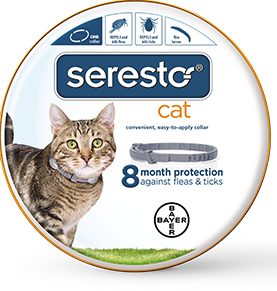 We have found that the topical treatments work best on cats as they can be very reluctant to pill administration. Luckily some of our favorite brands have taken that into consideration and offer topical preventative in the form of a spot on treatment or collar. Tick prevention is very important even in the cold winter months as some ticks have been know to thrive inside homes even when temperatures drop below freezing outside. Even if your kitty goes outside for short periods during the day, tick prevention should be considered. Côté, Etienne. “Cytauxzoonosis.” Elsevier: Côté: Clinical Veterinary Advisor, 3rd Edition · Babesiosis, 2015, www.clinicalvetadvisor3.com/book/chapter_00003-0395.php.